Science-fiction museum to open in Washington, D.C. Fans of Captain Kirk and Captain Nemo unite: A new science-fiction museum coming to Washington, D.C.
Its creators announced plans for the museum, which will cover a broad sampling of science fiction across literature, television, film, music, video games and art, on Nov. 4. They hope to open a preview space within a year, and launch the full museum in the beginning of 2017. “There really wasn’t a comprehensive science-fiction museum here in the United States or internationally,” said Greg Viggiano, executive director of the new venture. “I thought, maybe somebody should do something about this,” Viggiano told LiveScience. This entry was posted in Preview and tagged Amargosa Observatory, Arthur C. Clarke, Captain Kirk, Captain Nemo, Deep Space 9, Jules Verne, Museum, Ray Bradbury, Science Fiction. Bookmark the permalink. It’s been a little over a year since I began my science fiction reading challenge. 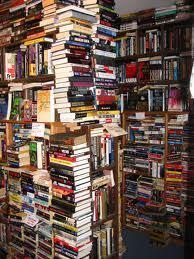 I used to be an avid reader devouring three to four books a month. As my responsibilities and priorities changed, reading for pleasure was sacrificed. I looked on this challenge as a way to get back into the groove of reading while expanding my knowledge of the sci fi verse. It’s been a slow summer and fall for my reading challenge. I have read quite a few books over the past year but only a few from the challenge. As an aside I highly recommend Lizz Free or Die by Lizz Winstead. A fascinating book of essays from an American original. After finishing the wonderful Foundation Trilogy, I dove into American Gods by Neil Gaiman. I couldn’t wrap my mind around it and quickly set it aside. It’s one of those books that it’s so layered that I must be in the right frame of mind to read. I’ll try and finish it but right now it’s at the bottom of the pile. Next up was Left Hand of Darkness by Ursula Le Guin. Left Hand tells the tale of an Ambassador Genly Ai sent to Winter to see if it’s citizens are interested in joining the planetary collective called Ekumen. The plot weaves its way through several cycles on the planet. Alone Genly Ai must deal with strange customs and xenophobia during his travels among the different nation states of Winter. Ms. Le Guin creates an unique world unlike any I have read about before. The people of Winter are what stood for me. They are gender neutral society who only choose a sexual identity when during the state of procreation. The concept of these ambiguous people really blew my mind. To live in a society were gender roles does not influence ones’ social interactions sounds liberating. Can’t wait fornthe next book in the series. However, up next for the challenge is I, Robot. An nice Asimov novel to cleanse the palette. 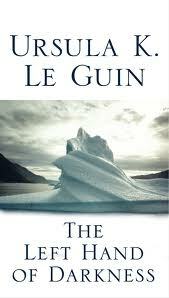 This entry was posted in Reviews and tagged Science Fiction, Ursula Le Guin; women in science fiction. Bookmark the permalink. What if? Two words that set the stage for an exhibition that explores the extraordinary ideas behind the genre’s most mind-bending creators. Icons of Science Fiction features iconic artifacts from sci-fi literature, film, television, and art, including an Imperial Dalek from Doctor Who, the command chair from the classic television series Star Trek, and Neo’s coat from The Matrix Reloaded. This entry was posted in Event and tagged Doctor Who, EMP Museum, Science Fiction, Star Trek. Bookmark the permalink. How Do You Define What Is Canon? While sci fi fans can be a stickler for what we consider sacred, does having a timeline/history set in stone help that hurt or help the development of show and its universe. I believe following the rich history of a storyline only enhances a show and its potential. TAS lasted two seasons and has influenced later shows and deserves to be included in the official cannon and obsessed over like the other shows and movies. Today, where we have seen countless shows live on in graphic novels after the original show had been cancelled. While researching Aeryn Sun for my piece on The Top Women in Sci Fi, I discovered that the Farscape story continued in a graphic novel. Some of my favorite shows like Firefly and Buffy still live on in the graphic forms. Not having read any of the stories featured in the graphic form, I wonder if my opinions of these shows would grow or change. This entry was posted in Musings and tagged Gene Roddenberry, Science Fiction, Star Trek, Star Trek: TAS. Bookmark the permalink. Last September, after discovering that I had read only a fraction of NPR Top 100 Sci Fi/Fantasy, I wanted to read all of the books on the list. How could I call myself a sci fi fan without having read what are consider classics of the genre. 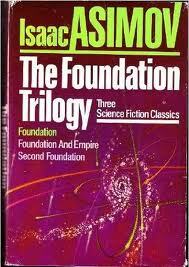 I started with the classic Foundation Trilogy by Isaac Asimov. It was a great way to kick off this journey. The Foundation Trilogy consists of Foundation, Foundation and Empire and Second Foundation. It is a multigenerational story that covers the collapse of a great empire and the race to prepare society for what follows. Hari Sheldon is a psychohistorian who along with his team uses social, mathematics, and psychology to plot a way to contain the chaos. Sheldon establishes two foundations who work independent of each other to propel the Sheldon Plan along. The Sheldon plan is never fully explained but the citizens of the foundation believe that its calculations will automatically solve any problems that arise with the implosion of the galactic empire. With a complex plot and a vast number of characters to keep track of, The Foundation series is nonetheless a page turner. Asimov is a titan in the Science Fiction world and rightfully so. Although his writings were simplistic in style, his influence can still be felt. Asimov was recently featured on The Science Channel show The Prophets of Science Fiction. This entry was posted in Books, Musings, Reviews and tagged Foundation Triology, Hari Sheldon, Isaac Asimov, Science Fiction, The Prophets of Science Fiction. Bookmark the permalink. Recently NPR books listed the Top 100 Science-Fiction, Fantasy books picked by its fans. As a Sci-Fi fan, I am surprised by the lower number of Sci-Fi/Fantasy books that I have actually read. After reading the list, I realized that I have only read 8 books! I have seen a lot of movies but reading, not so much. So, I am going to read all of the books on this list. The top 100 is a misnomer because they count trilogies and series as one entry. With that being said, I won’t give myself a time limited. Will you join me? This entry was posted in Books, Musings and tagged Books, Fantasy, NPR, Science Fiction. Bookmark the permalink. This entry was posted in Preview, Television and tagged Fall 2011, Science Fiction, Television Schedule. Bookmark the permalink.